Malaria parasites spread by successively infecting two types of hosts: female Anopheles mosquitoes and humans. 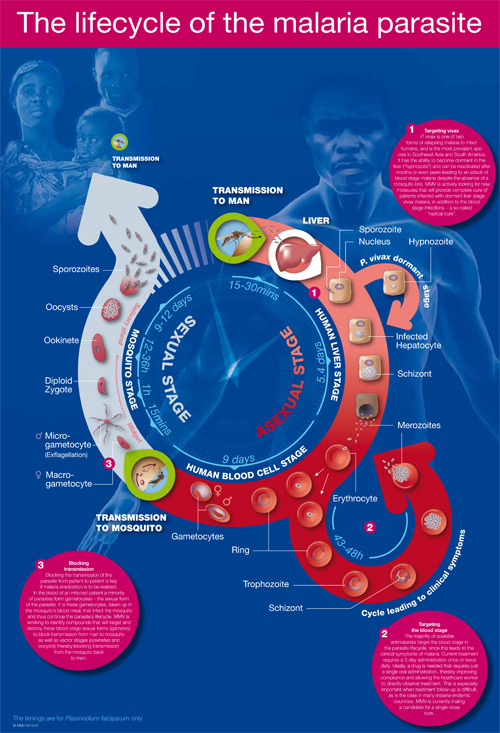 See an animated PowerPoint slide of the malaria parasite lifecycle. At the same time she takes a blood meal to nourish her eggs, the female Anopheles mosquito injects sporozoites into the blood stream of malaria’s next victim. The sporozoites are rapidly taken up by the liver cells. In all species of Plasmodium, these parasites develop to form schizonts (the multinucleate stage of the cell during asexual reproduction), from which several thousand merozoites develop. In Plasmodium vivax and Plasmodium ovale only, a proportion of the liver-stage parasites (known as hypnozoites) remain dormant in the hepatocytes. In this stage the parasite can remain dormant for months or several years. These two species of parasite can therefore initiate a cycle of asexual reproduction causing clinical symptoms in the absence of a new mosquito bite, giving P. vivax infection the name relapsing malaria. When the liver cells rupture, the merozoites are released into the bloodstream where they rapidly invade the red blood cells. These blood-stage parasites replicate asexually – rapidly attaining a high parasite burden and destroying each red blood cell they infect, leading to the clinical symptoms of malaria. The trigger is as yet unknown, but a small percentage of merozoites, differentiate into male and female gametocytes, which are taken up by the mosquito in her blood meal. It is these gametocytes that cause the cycle of transmission to continue back to the mosquito. Male and female gametocytes fuse within the mosquito forming diploid zygotes, which in turn become ookinetes. These ookinetes migrate to the midgut of the insect, pass through the gut wall and form the oocysts. Meiotic division of the oocysts occur and sporozoites are formed, which then migrate to the salivary glands of the female Anopheles mosquito ready to continue the cycle of transmission back to man.